What Grapes is Angelo Gaja Eating? If you didn’t know otherwise, you’d think he was a celebrity from stage or screen. The posh room at central Moscow’s posh Semifreddo restaurant and enoteca (that’s wine bar to you and me) was filled with people – breathlessly awaiting the arrival of the man of the hour, winemaker Angelo Gaja (pronounced GUY-yah). The crowd was mostly Russian with a dollop of expats, but it was all oenophile (that’s wine lover, to you and me). Not restaurant industry folk or a bunch of sommeliers, but regular people who simply love wine. A lot. With Gaja’s arrival, the room lit up – partially a function of the excitement his presence generated among his wineloving guests, but also in part a reflection of the soft-spoken man, who immediately asked everyone to take a seat and launched comfortably into welcoming remarks delivered in warm, hospitable tones. The first pitch was about wine – it’s beneficial to your health, it enhances the taste of food (with this group, clearly preaching to the choir). Then the narrative turned more personal, as Gaja spoke about his family, who immigrated to Italy from Catalonia in the 17th century, and the family winery, founded by his great-grandfather in 1859. 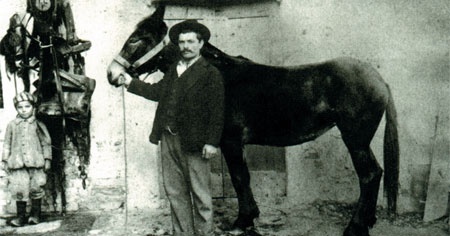 Giovanni Gaja was a local farmer who opened an osteria (something like a tavern) in his small Piedmontese town of Barbaresco. He started planting grapes to produce the wine served in his restaurant, and the vintage acquired an avid local following – so much so that the winemaking project outlasted the osteria, which closed in 1912. The winery continued to operate under the leadership of Giovanni’s son, and the Gaja family became known for producing the highest-quality Barbaresco, a red wine made from the Nebbiolo grape cultivated in Italy’s Piedmont region for hundreds of years. The Gaja Winery took Barbaresco beyond its traditional realm of local consumption, popularizing it on the national winedrinking stage. As Angelo narrated the family history, it was difficult to decide whether he speaks of his ancestors with the same reverence he accords wine or if he describes wine with the same tenderness he uses when referring to family. What is clear, however, is that the two – his wine and his family – are closely intertwined. However, strong family traditions have not kept Angelo from experimentation. For example, in the 1970s, he departed from local wine-producing norms when he planted Cabernet Sauvignon grapes in place of indigenous varieties, a move considered heretical by many around him, including his father. The result was a wine Angelo named Darmagi (dar- MAH-jee), Piedmontese for “what a pity,” which is what his father said when he learned of his son’s experiment. Angelo Gaja is known for his friendliness to modern technology, such as his introduction of a hot water pipeline into his cellar for sterilization and the use of stainless steel fermentation tanks, both of which were frowned upon by some hard-core traditionalists in Barbaresco. He also keeps busy exploring new types of soil: One current project is the growing of white wine grapes in a vineyard he acquired in Tuscany, an area not known as well-suited to the production of white wine. Innovation, not increased capacity, is where Gaja puts his energy. In fact, his commitment to retaining the intimacy of a family-run business while making a lovingly produced, artisanal wine is paramount. This was apparent as he described with pride how his winery has not grown: “We did not expand at all in the last 20 years. We have 100 hectares of vineyards and don’t buy any grapes. We produce 350,000 bottles a year, using only grapes we grow.” He added that his daughter has recently entered the family business, the fifth generation of Gajas to run the winery. The consummate host, Gaja created a mood that seemed to owe something to his great-grandfather’s osteria, even though he was in an upscale Moscow restaurant on a clammy autumn evening (by 6:00 pm it was already long dark). Before each course, Gaja took the floor to say a few words about the next wine, which he introduced as if it were a late-arriving guest whom he wanted those already present to welcome and embrace. And in between introductions, Gaja worked the room, over the course of the evening making it to each table to regale the diners with anecdotes. Usually winemakers don’t only the wine and not the grapes. But it’s very important to taste the grapes – it’s a big mistake not to. At one table, a lively conversation centered around the various wine-related vacations guests had taken. One couple produced an album with photos of grapevines nestled into the picturesque landscape of a French wine-growing region and shots of an adorable toddler in overalls crawling between gargantuan oak wine casks – evidently taken on their last family holiday. As the album was passed to Gaja, he issued a general invitation to take a tour of his winery, which is closed to the public. “Just call first,” he said. When it was time to introduce the winery’s flagship, Barbaresco, Gaja was in top form. “We live in a world of opulence,” he said, “and this fact makes elegance a rarity.” Applying this observation to viniculture, he noted that there are many opulent wines on the market, wines that are “rich, meaty, and easy to understand.” But elegance and subtlety are harder to come by, and it is precisely this dearth that has helped him focus on his task as a winemaker. As Angelo Gaja finished this last monologue, the delighted guests guffawed and drained their glasses of Barbaresco. Before the many takers of seconds could refill their glasses, he had moved on to chat with the next table, leaving at least one journalist in search of stills from La Dolce Vita to pose next to. But the metaphor taken from the world of film was apt in a number of ways, not least of which was the adoration Gaja’s wine-loving fans expressed for this celebrity of the grape. 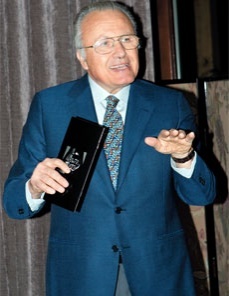 For those looking to try their first Gaja wine, Angelo Gaja recommends his 2004 Barbaresco. 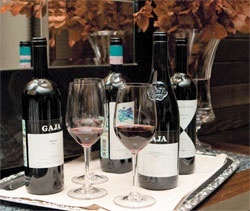 Gaja wines are distributed in Russia by DP Trade. For more information, visit www.wine-dp-trade.ru.